The thing is: I don’t have a Windows Phone 8 yet and the Windows Phone 7.8 APIs do not support this kind of Bluetooth communication. But: I have a Surface RT and with Windows 8.1 the RFCOMM API can be used to establish a serial link to the Arduino. You can get VisualMicro for free at http://visualmicro.codeplex.com/. They also offer a pro-version (>$20) with support for Breakpoint-Debugging. The Arduino IDE should be installed as well and you have to tell the VisualMicro extension where to find it. For the setup I’ll show here, I set up two LEDs, a potentiometer and of course the Bluetooth module (Fig.1). The Arduino has to be loaded with some code to send and receive Bluetooth messages. I created a Visual Studio solution with a blank Windows 8.1 app and a new Arduino sketch and added a new header file “SoftwareSerial.h” (Fig.2). The code of SoftwareSerial.h can be found here. Fig.2: A blank VS 2013 solution was created to which a blank Windows Store 8.1 application and an Arduino sketch were added. 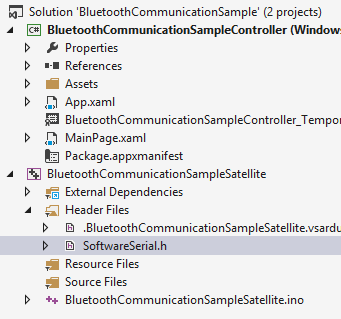 For the Windows 8.1 app we build a class, BluetoothConnectionManager to simplify enumerating, connecting, send & receive and state management. The code of the BluetoothConnectionManager and the actual application can also be studied in the sample application. As soon as you have everything set up, the Arduino code can be deployed via DebugStart new instance and the Windows 8.1 app can be launched. In the sample application I implemented broadcast of the potentiometer value and switching the LEDs on/off. Additionally the red LED automatically turns on/off depending on the analog value. One problem that this implementation brings, which I did not yet solve, is that simultaneous sending of a message by either party causes the other one to crash or get an exception. But due to my lack of experience, I do not know how to lock the streams to prevent this from happening..
Really nice work, congratulations! I’m really happy that my video inspired you :). Do you already have a http://www.forumnokia.com account? Nokia is going to release a tablet this year and your work would be appreciated there. And thanks to you for posting this great tutorial! Right now, I’m making a small remote control car, using the ATTiny85 (http://www.atmel.com/devices/attiny85.aspx). I don’t know if you know it, but it can be seen as a small Arduino. It have VCC, GND and I/O ports. You can use the Arduino UNO to write code into it and the JY-MCU Works like a charm with it. In fact, i’ve just tested the 3-colors example using the ATTiny85. Error	2	Error: DEP0700 : No se puede registrar la aplicación. error 0x80070003: no se puede registrar el paquete 1b2dd8e5-77f9-4ae9-8683-c4e46a492b0f_1.0.0.0_x86__eq9h3e6grdrp4 porque se detectó el siguiente error al crear el archivo de dependencias del paquete C:\Users\Ricardo\Documents\Visual Studio 2013\Projects\Bluetooth communication between Arduino and Windows 8.1\C#\BluetoothCommunicationSampleController\bin\x86\Debug\AppX\microsoft.system.package.metadata\S-1-5-21-1862554326-2498594583-4198777847-1001.pckgdep: El sistema no puede encontrar la ruta especificada. Try to “clean” and “rebuild” (right click the project). This looks like some kind of communication error. You can either try/catch errors and debug it or do your own code because that’s where incoming messages arrive. Hi, In fact is my own code based in yours. The only diferrence between your code and mine is that I launch the arduino code from the arduino ide. It will be great if you could look into my code. I send you two links to download my code the first one with the code of visual studio and the second one with the code of arduino. On the receiving side you can then use breakpoints and look at the values directly. I did this stuff only once and it is sometimes very confusing.. Thanks I solved the issue. The problem were the bluetooth device to solved I reset to default settings the device. are you sure that the pin TX and RX of the bluetooth module cnnected to to the right pins of the board, because pin 10 and 11 of arduino board is PWM, and they cannot transmit or receive the signal. yes, that’s the nice thing about SoftwareSerial. 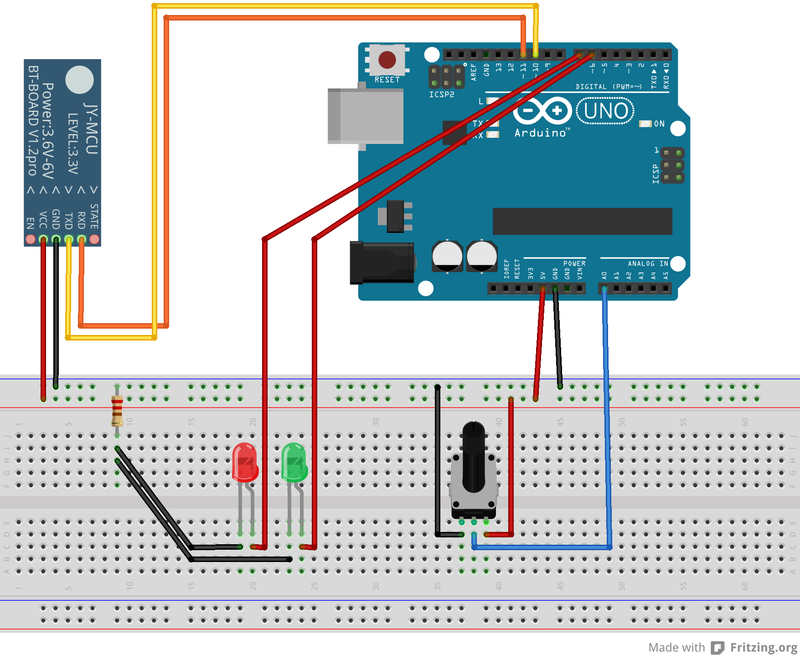 Maybe you can program the Arduino to send a simple string every 10 seconds and turn on the LED of pin 13 at the same time. Than you can correlate that moment with the moment when the Debugger in Visual Studio breaks at the line with the exception.